Oslo, Norway (CNN) -- Norway's prime minister pledged that his country would remain "an open society" in the wake of Friday's massacre in Oslo and a nearby youth camp but said the bloodshed has changed the nation. "I think that I will never be able to explain it fully to myself how this could happen, the horror that so many people experienced at that island on Friday," Prime Minister Jens Stoltenberg told CNN. Authorities revised the death toll from Friday's attacks to 76 on Monday -- eight in a bombing at the Oslo building that houses Stoltenberg's offices, the rest at a summer camp run by his ruling Labour Party. A 32-year-old suspect has acknowledged carrying out the attacks but said they were necessary to prevent the "colonization" of the country by Muslims, a judge said Monday. "I think that this will change Norway," Stoltenberg said. "We'll have a Norway before and a Norway after the bomb and the killings." But he added, "Even after these terrible incidents, (Norway) will be an open society." 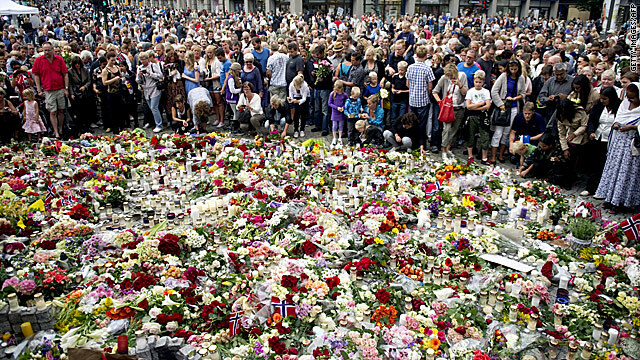 Nearly 200,000 people participated in a memorial Monday in downtown Oslo to honor the victims, authorities said. Trains were halted as part of a nationwide observance to remember the victims of Friday's slaughter, and Oslo Mayor Fabian Stang said the turnout showed that Norwegians do not accept violence. "Today, people turned out to show that this town is ours and we don't accept this," he told CNN. The suspect, Anders Behring Breivik, accused the Labour Party of "treason" for promoting multiculturalism, Judge Kim Heger said after a closed hearing Monday. According to Heger, Breivik also said that he worked with two cells to launch the attacks, the deadliest attack in Norway since World War II. Police refused to comment on the claim, but a police official said Breivik appeared "very calm" during his hearing. "He was very concise in trying to explain why he was trying to do this," the official said. Sveinung Sponheim, Norway's acting National Police chief, said Sunday that Breivik had told investigators he acted alone and was not aided in the planning of the attacks. He has pleaded not guilty, and two court psychiatrists will be assigned to the case, police said. Monday's hearing was closed to the public for "security reasons and because of a concern that it would impede the investigation," court communications director Irene Ramm told CNN. Afterward, Heger told reporters that he had ordered that Breivik remain in custody for eight weeks until his next scheduled court appearance. The reported toll was as high as 93 over the weekend before being revised downward Monday. A police official said some victims may have been counted twice -- but officials predicted the toll could rise again, as investigators continued to search in and around the camp on Utoya Island for victims. Among those killed on the island was Trond Berntsen, the step-brother of Crown Princess Mette-Marit, according to a statement released by the Royal House Communications Office. At least four people remained unaccounted for Monday night, with investigators searching nearby waters for victims who may have drowned trying to escape the shooter. Breivik appears to have written a 1,500-page manifesto that rants against Muslims and lays out meticulous plans to prepare for the attacks. In it, he vilifies Stoltenberg and the Labour Party, accusing it of perpetuating "cultural Marxist/multiculturalist ideals" and indoctrinating youth with those ideals. The author accuses the Labour Party of embracing those ideals and allowing the "Islamification of Europe." CNN has not independently confirmed that Breivik is the author of the manifesto, which bears his name and says it is intended to be circulated among sympathizers. The writer rails against Muslims and their growing presence in Europe and calls for a European civil war to overthrow governments, end multiculturalism and execute "cultural Marxists." It contains photographs of Breivik wearing what appears to be a military uniform that features an altered U.S. Marine Corps dress jacket with medals of the Knights Templar -- an order of Christian Crusaders who helped fight against Muslim rule of the Holy Land in the Middle Ages, but which was shut down 700 years ago. Breivik asked to wear a uniform to the hearing but was not allowed to, Heger said. Heger said he ordered Breivik held in isolation for the next four weeks to ensure he has no opportunity to tamper with evidence, Heger said. The suspect has access to his lawyer but to no one else, and not to letters or news, court officials said. Police spokesman Henning Holtaas told CNN that the suspect was charged with two acts of terrorism, one for the bombing and one for the mass shooting. In Norway, which does not have the death penalty, the maximum sentence for such a charge is 21 years. However, the court could impose an extension, if the person were deemed still to be a threat after having served the sentence, he said. According to the Norwegian newspaper VG, which cited unidentified sources, Breivik told investigators during interviews that he belonged to a revived Knights Templar. He described the organization as an armed Christian order, fighting to rid the West of Islamic suppression, the newspaper said. Holtaas declined to confirm the news report, which mirrors statements in the manifesto. Breivik's lawyer, Geir Lippestad, told Norwegian broadcaster NRK that his client had expected to be tortured by police and shot during Monday's court proceeding. Breivik is prepared to spend the rest of his life in jail, his attorney said. But Stang had a different fate in mind: "We're going to punish him with democracy and love," the Oslo mayor told CNN. CNN's Jonathan Wald, Nic Robertson, Michael Holmes, Jennifer Deaton, Erin McLaughlin, Chelsea J. Carter and Greg Botelho contributed to this report.